Drilling holes where the depth is much greater than the diameter of the bore is a traditional problem. One obvious example of this is drilling holes in gun barrels. The solution to this is the gun drill. A gun drill is nothing like a traditional drill bit. There are certain key features. Firstly the shaft of the gun drill is made from a hollow tube. This tube is slightly smaller in diameter than the hole being drilled. This tube is squashed on one side to form a v-shape along the length of the tube. This is so coolant can be pumped down the middle of the tube. It comes out at the cutting edge and the returns in the V-shaped groove. 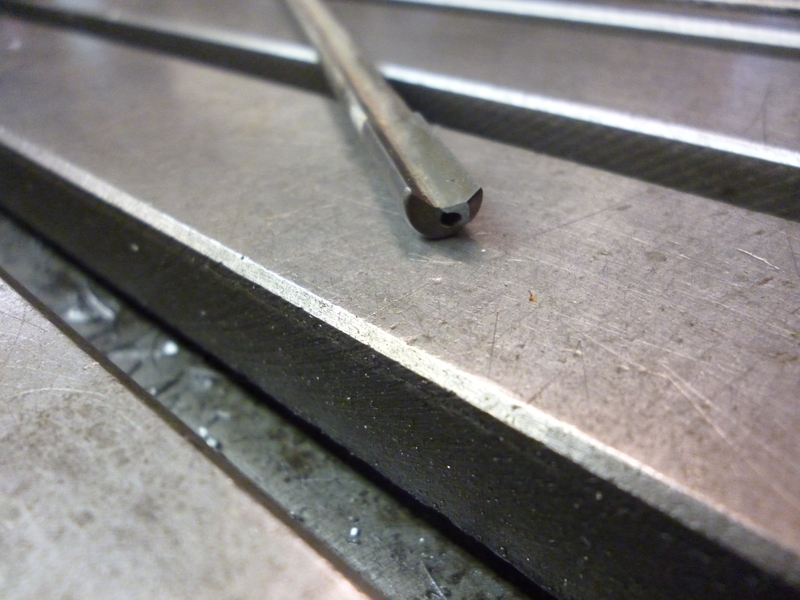 The coolant is pumped in at a very high pressure so as to force the swarf back along the V-shape. The workpiece is held in the chuck and is rotated. The drill is fitted to the toolpost so the drill is feed automatically into the workpiece. The idea is that the cutting fluid is pumped down the center of the tube. This not only lubricates the cutting action but it also forces the swarf back up the outside of the tube especially in the v-shape. 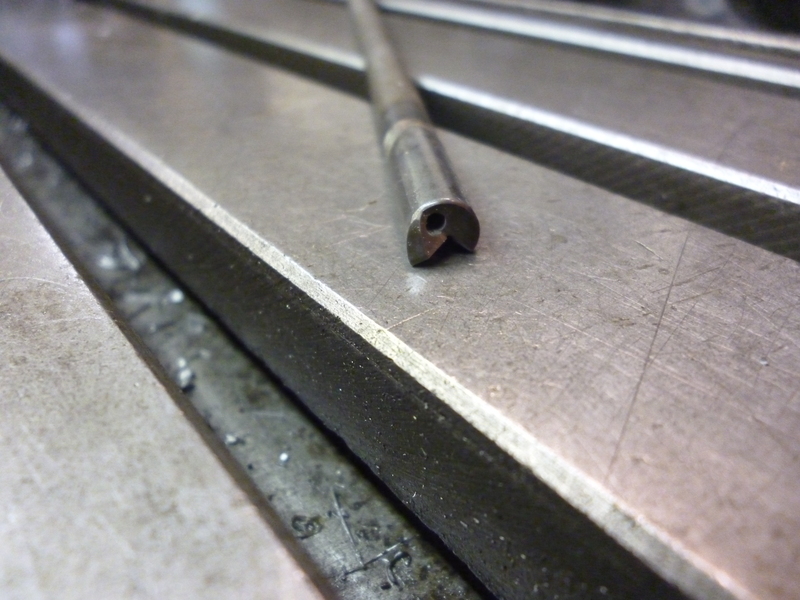 Secondly the cutting part of the gun drill consists of a round piece of carbide. 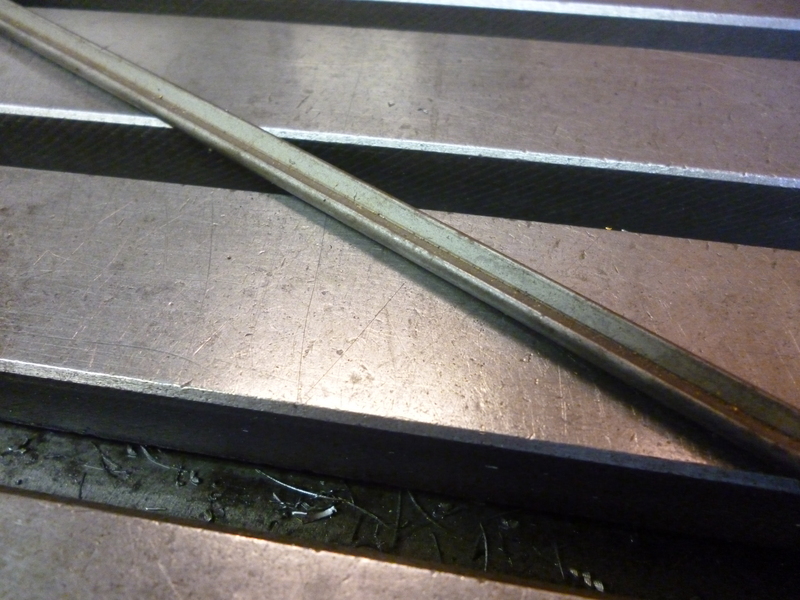 This is brazed onto the shank. It is about 25mm long in this example. The diameter is the the bore of the barrel, in this case, 0.265inches. This part has a v-shaped formed in it to match the v-shape in the shank. It has one cutting edge. It also has a small hole in it the enables cutting fluid from the shank to get to the cutting edge. A gun drill can only drill a conventional round hole. This hole is then reamed to a slightly larger size. This then is lapped and polished. If the bore is to be rifled then this can now be done.